A subsidy is when the government helps pay for all or a portion of your health premiums. If you make too much to qualify for Medicaid and can’t afford health insurance; you may qualify for assistance. 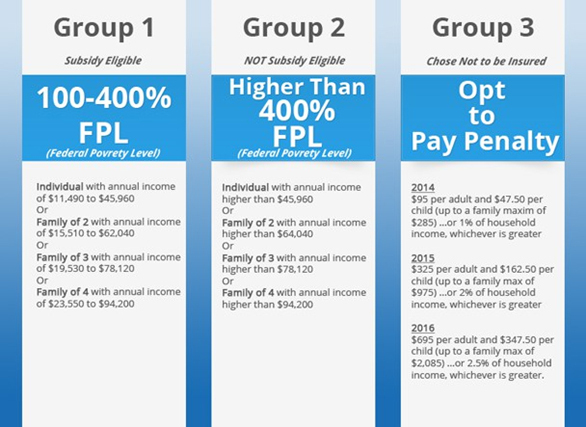 If you qualify for a subsidy you have two options to consider. The first option is to accept an advance tax credit, which is paid by the federal government directly to the insurance company of your choice. The second option is to pay the full premium out of your pocket each month and receive your tax credit (subsidy) when you file your taxes in a lump sum. Families of 4 or More? Be a U.S. citizen or national, or be lawfully present in the U.S. If married, must file your taxes jointly<?